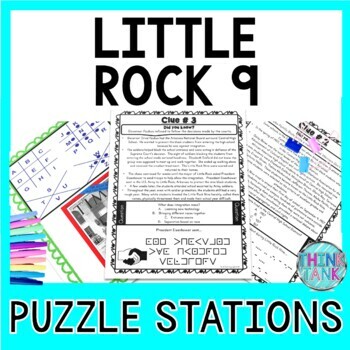 The Little Rock Nine Escape Room will take students on a secret mission around the classroom! This escape room has students decode interesting facts about the Little Rock Nine, Brown v. Board, segregation and integration. This resource can be used so many ways. The Little Rock Nine Escape Room has students walking around the classroom breaking codes. The codes include ciphers, Morse code, cryptograms and a final 4 digit code based on the decoders/clues. Each clue and code is different. The codes require students to think differently to decipher or decode them. Some codes are easier than others. Some codes require critical thinking to determine what a letter/symbol stands for. Each code will reveal interesting facts about the Little Rock Nine. The use of secret code will keep your students engaged while competing to find the final code. Students can report the final code to you. If you wanted to, you could purchase a 4 digit lock that you program, but it is not necessary at all! No props needed!! This is a NO PREP, PRINT & GO Activity! Students practice hands-on, practical problem solving skills all while learning about Little Rock Nine. Your students will be inspired to think outside the box! Spy themed music is highly recommended! The best age range for this resource is 8+. Please look at the preview to determine if this resource works for your age group. Younger students may need some help with some of the more difficult codes. You can use the pre-labeled clues or you can challenge older kids to choose/find the decoder that works for each of the clues. A set of labeled and non-labeled decoders are included for differentiation. A “How to Decode” puzzles is also included. In addition to learning or reinforcing the subject matter, my escape rooms encourage teamwork and critical thinking. As a “timed” challenge, students will be engaged from beginning to end. An answer key and easy to follow teacher directions are provided. New Feature: I have included a 6 question formative to complete as proof of understanding. Each “clue” also has one question to answer to ensure comprehension for a total of 10 questions. Many times students rush to solve the puzzles without reading or comprehending what they read. The questions need to be answered correctly before they can win! DISCLAIMER : When learning about history, students are often asked to examine and discuss difficult, sensitive and disturbing historic events and time periods. This resource is in no way meant to trivialize the importance and sensitivity of the topic. As a teacher it is important to set the stage and recognize the diversity of your students. In no way am I trying to make the issue of seem less important, less significant, or less complex than it really is. This resource was created to allow students to move around the room and learn about a difficult topic in a fun and engaging manner. If you do not feel that this resource is right for you, please do not purchase it. Below is a list of resources that will help teach empathy and understanding of sensitive topics. These sites offer expectations about the content and manner of communication. Click HERE to join my newsletter and get a FREE Escape Room! Martin Luther King Jr. ESCAPE ROOM! Black History #1 ESCAPE ROOM! Black History #2 ESCAPE ROOM! Civil Rights Movement ESCAPE ROOM! Black History ESCAPE ROOMS BUNDLE! BUNDLE: 4 US HISTORY ESCAPE ROOMS! Declaration of Independence ESCAPE ROOM! Causes of the Revolutionary War ESCAPE ROOM! 6 Pack BUNDLE ESCAPE ROOMS! 8 PACK BUNDLE of ESCAPE ROOMS! 10 PACK BUNDLE of ESCAPE ROOMS! Christopher Columbus ESCAPE ROOM Columbus Day! Boston Tea Party ESCAPE ROOM! Trail of Tears ESCAPE ROOM! French and Indian War ESCAPE ROOM! War of 1812 ESCAPE ROOM! Battle of Bunker Hill ESCAPE ROOM! World War II ESCAPE ROOM! World War I ESCAPE ROOM! Ancient Civilizations ESCAPE ROOM BUNDLE! Growth Mindset #3 ESCAPE ROOM- MODERN VERSION! Growth Mindset #2 ESCAPE ROOM! Test Taking Strategies ESCAPE ROOM! BUNDLE of 3: Growth Mindset, Growth Mindset #2 AND Test-Taking Strategies ESCAPE ROOM! Growth Mindset #4 ESCAPE ROOM! 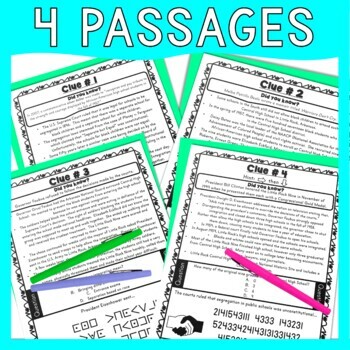 Growth Mindset ESCAPE ROOMS- 4 Pack BUNDLE! Revolutionary War Battles Scavenger Hunt! Causes of the Revolutionary War Scavenger Hunt! Battles of the Civil War Scavenger Hunt! Christmas and Hanukkah/Chanukah ESCAPE ROOM! ESCAPE ROOMS BUNDLE- 3 Holidays! HUGE Growth Mindset and Holidays ESCAPE ROOMS BUNDLE! Christmas Season Fun Facts ESCAPE ROOM! Pearl Harbor Day ESCAPE ROOM! St. Patrick’s Day ESCAPE ROOM! Christmas Around the World ESCAPE ROOM! February Bundle of 5 ESCAPE ROOMS! Cinco de Mayo ESCAPE ROOM! Branches of Government ESCAPE ROOM! Bill of Rights ESCAPE ROOM! 25 Pack of ESCAPE ROOMS! 5 Pack Constitution ESCAPE ROOMS! Articles of Confederation ESCAPE ROOM! Citizenship and Naturalization ESCAPE ROOM! Statue of Liberty ESCAPE ROOM! California Gold Rush ESCAPE ROOM! Lewis and Clark ESCAPE ROOM! Westward Expansion ESCAPE ROOMS BUNDLE! Presidents 1-12 Fun Facts ESCAPE ROOM! Presidents 13-24 Fun Facts ESCAPE ROOM! Famous Failures #2 ESCAPE ROOM! Susan B Anthony ESCAPE ROOM! Back to School ESCAPE ROOM! Back to School Doodle Stations!